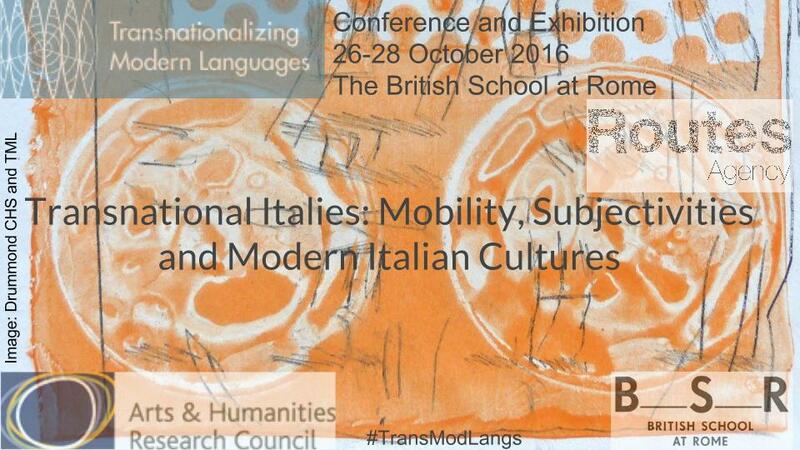 TML Conference, the British School at Rome, 26-28 October 2016. 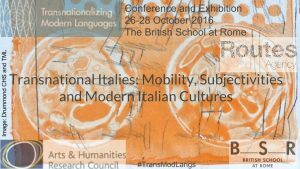 The history of Italians and of Italian culture stems from multiple experiences of mobility and transnationalism. Such experiences reflect the history of Italy as an ‘emigrant nation’ (Choate), an imperialist power, and a European country facing the challenges of world system transformation from its Mediterranean location. These histories of mass movements also represent millions of individual and collective trajectories, traced through micro-processes of cultural translation, acts of transmission, and memory mediation of subjects from a variety of national, linguistic and cultural backgrounds. The conference, with keynote presentations from Ruth Ben-Ghiat and Marina Warner, represented an important output of the project. Accompanied with the project exhibition, it aimed to shed new light on the history of Italian cultural mobility. It explored how the notion of ‘Italianness’ has been dynamically reformulated and performed by individual and collective subjects drawing from ideas of the nation state and its regimes of citizenship, from transcultural practices and transnational imaginaries. It set out to broaden the frame in which we read Italian history, memory and culture, considering the multiple levels of their negotiation, mediation and remediation. It aimed to stress the fluid and relational nature of (Italian) culture and belonging, by investigating events, media and memories through which they have been materialised, imagined and performed. The conference was an extremely rich and stimulating event, drawing participations from researchers working in different parts of the world. The programme of the conference is available here and video recording of the plenary sessions is available below. The video recordings are by Gianfranco Fortuna. See more information about the Conference here.